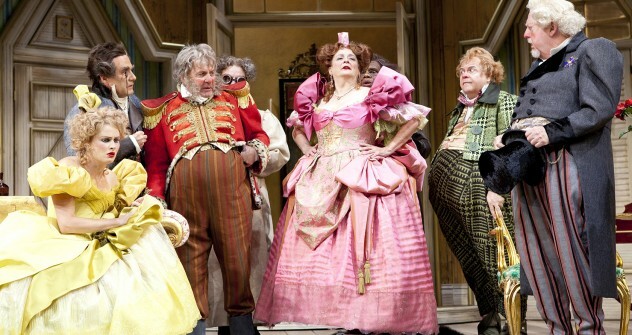 The cast of the Shakespeare Theatre Company’s production of The Government Inspector, directed by Michael Kahn. Source: Scott Suchman. D.C.’s Shakespeare Theater Company presents its first Russian play in a quarter century and garners some high praise. When Nikolai Gogol wrote “The Government Inspector,” he was sure Russians would see themselves brutally reflected in his mocking farce, and that his art would motivate them to change. This is why the most famous lines in the play: “What are you laughing at? You are laughing at yourself, oh you…” is addressed directly to the audience. The sensitive playwright, who later in his life burned his unpublished work and effectively starved himself to death, was deeply angry when he saw that audiences were merely happily amused by his art. Jeffrey Hatcher has adapted dozens of plays, from Sherlock Holmes to “Tuesdays with Morrie,” the bestselling book about the revived friendship between a dying professor and his former student. Hatcher took a large dose of liberty with “The Government Inspector,” even writing in his own jokes. But it has paid off. It’s true that Gogol, and some Russian audiences, might not fully recognize Hatcher’s adaptation, but it is a loving tribute nonetheless. The run has been extended into November. “The Government Inspector” is also remarkable in that it is the first Russian play the Shakespeare Theater has produced in the 25 years Michael Kahn has been at the helm. Kahn has been to Russia, where he has produced Tennessee Williams. And while he always wanted to direct a Russian play at STC, he didn’t want to do the familiar works. One reason “Inspector” plays so well in the Beltway is that the city, from K street lobbyists to Capitol Hill, is no stranger to corruption. And the U.S. has certainly seen its share of Gogolian characters in the past 20 years. At an STC symposium, Hatcher said that it’s still “easier to look at corruption in Russia” than at home. Several STC regulars are featured in the madcap comedy, including Rick Foucheux as the mayor and Nancy Robinette as his wife. The purposefully padded costumes in neon pastels are hideously baroque, creating a kind of 19th century Seussical-look. Actor Derek Smith (who for several years was Scar in “The Lion King” on Broadway) plays a funny, charming, chameleon-like Khlestakov, the troubled, fast-talking ne’er do well at the center of Gogol’s play. Khlestakov, sometimes referred to as an “empty vessel,” tries to transform himself into what the mayor and his townsfolk believe him to be—an important government inspector who has arrived to clean out the place. Even for those who haven’t seen a Gogol play, Khlestakov cuts a familiar figure—the man with the invented resume. The audience warms to him, even as he wakes up each morning with a certain horror and guilt about the night before. What begins as a case of mistaken identity becomes a tortured deception, and the humor becomes more pitched as the play gains momentum. At the symposium discussing the play, Jeffrey Hatcher talked about how the play speaks to Americans. Gogol’s absurd masterpiece has a certain universality that Hatcher tweaked. “The play is based in a Russian town, but it could be Steubenville, Ohio. It could be anywhere,” Hatcher said.